You are an integral part of our success. 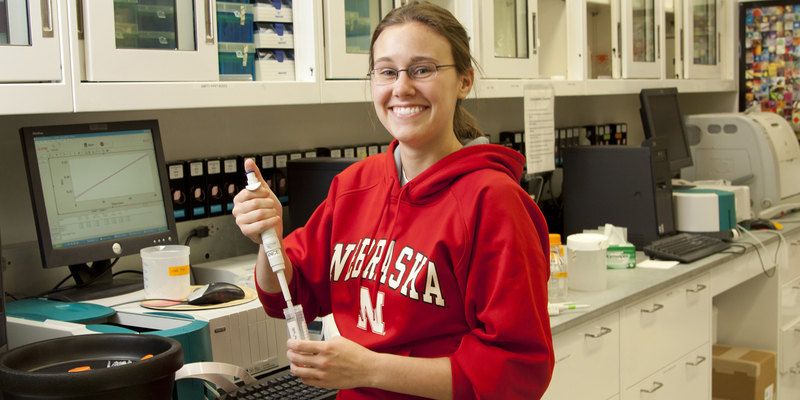 Established in 1992, the Center for Biological Chemistry Graduate Program is one of the most successful programs at the University of Nebraska. Our program currently consists of more than 20 faculty members mentoring approximately 30 students. The size of the group allows for extensive personal attention from faculty mentors and contributes to fluid collaboration among students and other researchers. Our strength lies in our commitment to the development of new scientists, by cultivating supportive working relationships in our research community. Graduate students pursuing a Ph.D. degree and in good standing are supported by a graduate assistantship throughout their training. Many of our students are recipients of University-sponsored fellowships that augment the base stipend. Assistantships also include 12 credit hours of graduate coursework per semester and subsidized health insurance. Elements of our graduate program are supported by an NIH-funded Cellular, Biochemical, and Molecular Sciences Predoctoral Research Training Grant. Lincoln ranks among the best mid-sized cities and offers a low cost of living, an array of entertainment options, and numerous outdoor activities. Average time to completion of Ph.D. is 5.1 years.